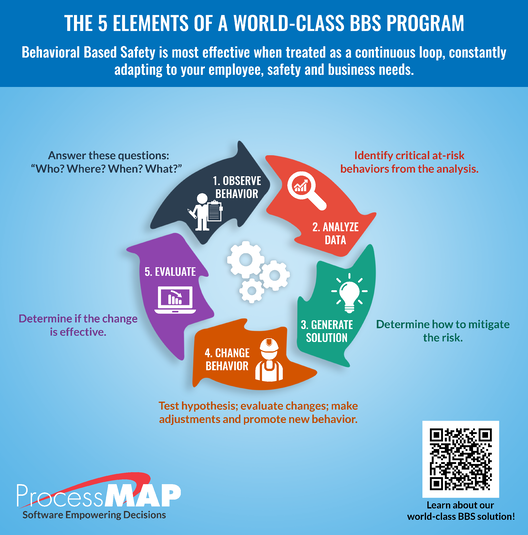 This is the final post in a three-part series on Behavior Based Safety (BBS). In Part 1, I provided a high level overview of BBS programs and the five components that comprise a word-class program. Part 2 covers how to analyze observation data in order to identify critical at-risk behaviors, generate solutions, and change behavior. This post will cover the “evaluate” step, discussing metrics that will help you determine if the change has been effective so that you can continually improve performance. Let’s face it – collecting and analyzing data isn’t easy. In addition, calculating the actual risk associated with these behaviors can seem like a daunting task. Here are some metrics that can help you start down the path of analyzing your data. Set a goal to observe and provide feedback to a set number of people in your operations on a monthly or weekly basis. This goal will change based on your corporate culture and the program’s maturity. The goal is typically set at a number of unique people observed, rather than number of observations recorded. BBS observations should be generating Corrective and Preventative Actions (CAPAs). Just like in any other CAPA system, you should be measuring the number of created actions as well as closed actions. Participation is paramount, so you should be tracking how many trained individuals are actually conducting the number of observations requested of them. Follow up with those that are falling short of their observation goals. This metric is a bit outside of the norm and requires some leg work, but it’s a necessity if you are to understand the overall effectiveness of your program. To track this metric count the people who know the observations you are focusing on, they should be able to name the top few. Self-explanatory - the average percentage of safe observations for your behaviors. Make sure every level of the organization is involved, from C-Suite all the way to the night cleaning crew. These metrics are all lagging indicators. To be successful, you will need to have at least one leading indicator. Luckily, I have a trick I’ve learned over the years for creating leading indicators. To create your leading indicator, take some or all of your lagging indicators and add them together. Next, divide this sum by the total number of unique observations performed. The resulting number will be a score showing the total percentage of observations that align with your program objectives. Watch this number - it will tell you if your program is gaining in popularity and momentum or struggling. What metrics do you use to track your program’s progress? Leave a comment below!